Information on Cranial Electrotherapy Stimulation, non-drug relief from insomnia, anxiety, stress and depression by CES Ultra, brain stimulation device. Discover more about the breakthrough technology of Cranial Electrotherapy Stimulation and the peace of mind, relaxation, and restful sleep that the CES Ultra brings to those who suffer from anxiety, depression, and insomnia. Check out our articles and links below. The Science behind the CES Ultra provides you with a compilation of scientific studies on CES. The CES Ultra stands apart from all other devices, especially in the context of Meta-analyses. A Meta-analysis contrasts and combines the results from many different studies rather than relying on a single study to draw particular conclusions. 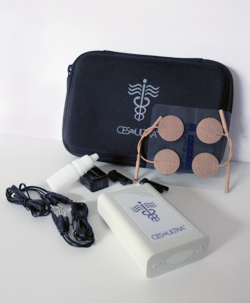 Contact us today to learn more about Cranial Electrotherapy Stimulation and the user-friendly CES Ultra.